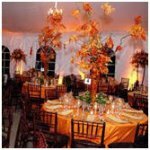 If you are going to have your wedding in the fall you will want to consider the colors that come with fall will be darker and richer than the other seasons. You really do not want to have a really bright color scheme for fall. These are some great colors that you can go with for your beautiful fall wedding. Orange spice is a very nice and warm color for fall. Roses, tiger lilies, or calla lilies are nice flower choices to go with this color selection. Chocolate frosting for your cake will accent the flowers from the bridal party. Purple and gold together can make a pretty combination as well for a fall wedding. 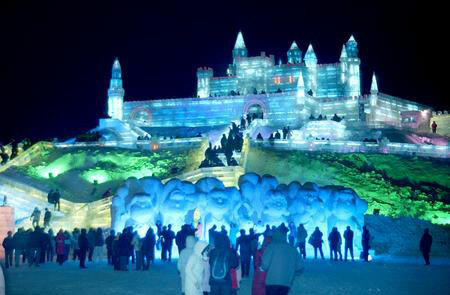 This can be a great idea for a back drop. Also you can use purple in the bride's maids gowns, and the bouquet can have purple and gold mixtures in it as well. The cake can be a pretty purple with gold trim around or have some gold designs through it. The table set ups can have different purples in it as well along with maybe a gold table cloth. I would not go with a regular red. If you want a red in color i would go with a cranberry deep red. You can have all the brides maids in this beautiful and warm red color. Also the flower arrangements can have Red Asiatic lilies, gerberas, roses or mums. The bride can accent her dress with this color shoes and a sash around her shoulders. Browns are another color you can choose from for your wedding. 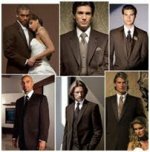 The men can wear brown tuxedos. And the bride can go with an ivory dress. The flower arrangements can be different browns, gold's and green these colors will all fit together. These are just a few color schemes that you can go with for a fall wedding. 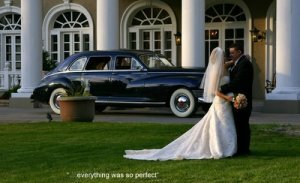 Below are several pictures that may help inspire you with ideas for your fall wedding. You can see the color schemes these pictures portray for their fall wedding colors. Share a link to a page on Best Colors For A Fall Wedding and we will consider it for placement on this page.